Hall County Parks and Leisure is partnering with Alto Pictures and the Hall County Board of Education to present a concert at Cherokee Bluffs Park later this month, benefiting local schools' performing arts programs. "This is a wonderful opportunity for residents to come out and enjoy good music at Hall County's newest park while also raising funds for a good cause," said Hall County District 1 Commissioner Kathy Cooper. 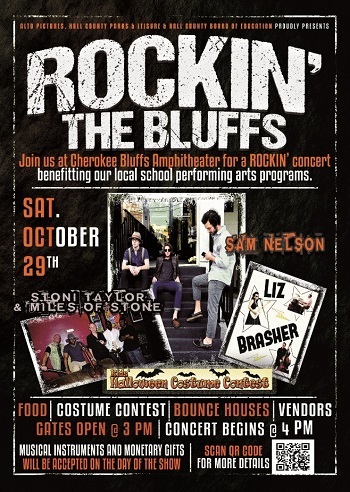 Rockin' the Bluffs will be held on Saturday, Oct. 29 and will feature a costume contest as well as musical acts Sam Nelson, Liz Brasher and Stoni Taylor & Miles of Stone. Food, bounce houses and various vendors will be available. Gates open at 3 p.m. with the concert to begin at 4 p.m. Musical instruments and monetary gifts will be accepted on the day of the event.